Real estate is not a sales business. Rather, if you approach the work as a consultant and come from a place of contribution, clients will come to you by way of referrals—and you may not need to do any prospecting at all. By simply going ALL IN with your database and creating systems to maintain relationships with your previous clients, you can survive and thrive without buying a single lead. Sandra Löefgren is a Keller Williams agent who services the San Diego area. Originally from Sweden, Sandra has been in the US for 13 years, and she got her start in real estate just three years ago. She was named Rookie of the Year in 2016, and her relationships-first approach has skyrocketed her to the top 5% in the San Diego MLS. 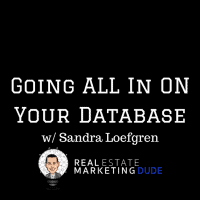 Today, Sandra sits down with me to share the key to her early success in real estate, explaining why she chases relationships rather than leads. She discusses her niche in working with military families, her approach to asking for referrals, and her systems for maintaining relationships with previous clients. Sandra offers insight on coming from a place of contribution rather than self-fulfillment and staying top-of-mind through regular check-ins. Listen in for ideas on organizing unique client events and learn how Sandra earned Rookie of the Year honors without buying a single lead! Email Sandra at realtybysandra@gmail.com, or give her a call at 619-850-8328.